• For prevention and quick recovery from iron deficiency. • Ensures quick rise in haemoglobin. • Facilitates high bioavailability of iron. • DOES NOT CAUSE CONSTIPATION or GASTRIC IRRITATION. NatHaem® is prepared by complexing ferrous iron Fe(2+) and naturally occurring dimeric and oligomeric-dibenzo-alpha-pyrone with small molecular weight herbal gallo-tannoids, which maintains iron in the ferrous state as only ferrous iron is utilised in the synthesis of haemoglobin. NatHaem® ensures sustained release, optimum absorption and high bioavailability of iron with improvement in % saturation of iron binding protein. NatHaem® easily releases iron to ‘iron hungry receptors’ and captures any ferric iron Fe (3+), let loose by the system for further complexation. The reducing property of the NatHaem® complex, through the polyphenol moieties, causes reduction of Fe3+to Fe2+, systemically, resulting in mobilization and functionalization (e.g. attachment to globin moiety of haemoglobin) of systemic iron. NatHaem® is very effective in quickly raising the haemoglobin level of blood (upto 1 gm/dl/ week). NatHaem® also optimizes saturation of body iron stores by decreasing total iron binding capacity (TIBC), even in the persons with apparently normal haemoglobin. It is also very useful for the individuals suffering due to inefficient production of erythrocytes or increased loss of RBC in haemorrhagic anaemia. NatHaem® can be safely used with high success in persons who normally do not respond to other iron preparations. 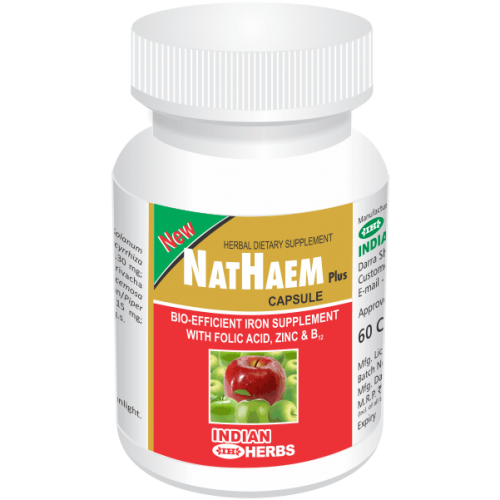 NatHaem® is safe for prolonged use in all age groups and does not produce any toxicity or gastric irritation. Iron deficiency anaemia in children, ladies particularly during pregnancy and lactation and others at any age and stage. Anaemia due to haemorrhage, helminthic infestation and nutritional iron deficiency. For optimum growth and better health in children. For women in reproductive age group to maintain haemoglobin, health and working efficiency at optimum levels. Adults : One capsule, once daily. Children : 1-2 teaspoonful, once daily. To be given orally after meals, till required.